There seems to be something about World Cups in Mexico that brings out the best in ITV. In 1970 they famously enjoyed great popularity with their celebrated expert panel and now, 16 years later, their theme tune would be a winner. A good measure of how successful ITV’s tournament theme tunes were in this period was how much they were heard thereafter. If that is the barometer then Aztec Gold by Silsoe was certainly a winner. The catchy tune went on to be used by ITV for their live domestic coverage in the next two years and again during Euro ’88, before serving the opening titles of Saint & Greavsie until 1992. But its main association would always be with where it all began – Mexico ’86. ITV’s opening titles for the Mexico ’86 coverage. The BBC went for a similar title for their theme tune, with Aztec Lightning by Heads. The song would fail to make the impact Nessun Dorma did four years later, although the opening titles seemed quite advanced at the time. This was the first major football tournament hosted by Des Lynam, whose laid-back style had already won admirers on Grandstand. He presented from London in a studio surrounded by pot plants, with Emlyn Hughes, Lawrie McMenemy and Terry Venables among the regular summarisers plus a pre-Sky Sports Andy Gray. George Best was billed as a pundit, bus alas was a no-show. 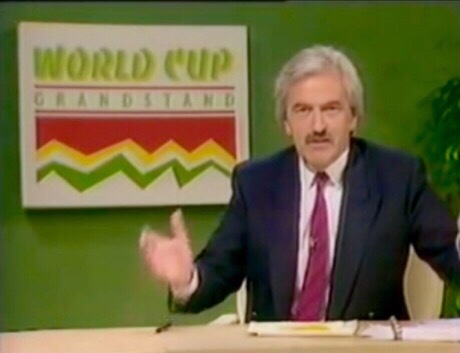 Des Lynam was the host of BBC’s live coverage of Mexico ’86. As England prepared to begin their World Cup campaign against Portugal on June 3, there was hysteria in the press that the match could go untelevised back home. This wasn’t due to a contractual dispute like the one that had led to a blackout of Football League action in the first half of the 1985-86 season, but because of serious transmission problems that blighted the opening couple of days of the competition. “We can only keep our fingers crossed,” said BBC editor Bob Abrahams, no doubt fearing the barrage of calls to the switchboard if there was a loss of picture or sound when England played. The match between Brazil and Spain on the second day had brought the most noticeable technical problems, to the extent that Brian Moore and Brian Clough ended up commentating for ITV from the London studio in place of the on-site commentators. But the UK could be grateful for small mercies. We could at least see the pictures, for some other countries the consequences of the technical problems were such that viewers couldn’t even enjoy that luxury. 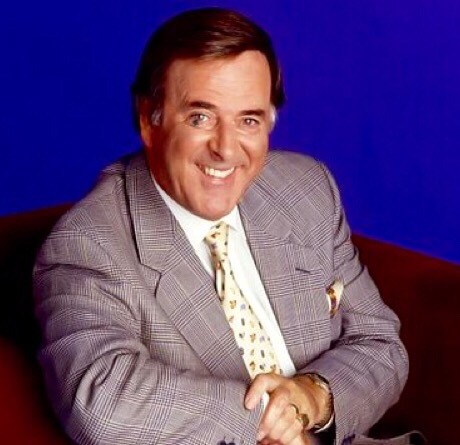 Terry Wogan’s chat show was considered a bigger ratings winner than live World Cup action. The England match went on air as planned and soon enough the coverage of the tournament was resolved for everyone to enjoy. However, it would not quite be a case of wall-to-wall football. In the early stages of the competition there were usually two matches played simultaneously at 7pm (BST), yet British audiences were frequently afforded just live coverage of the second half of one and brief highlights of the other. Shows such as Wogan (BBC) and Coronation Street (ITV) took precedence over the first half of these matches, with exceptions such as when UK sides played at that time. The 11pm kick-offs proved less of a burden to programme controllers, World Cup action probably seen as a welcome audience puller at that time of night. But less than half the group stage matches were shown live in full in the UK, which perhaps reminds us where football stood in its dark days of the mid-1980s. England’s participation in the group stage proved fraught, as the millions of viewers who stayed up for three matches at 11pm – only one of the games being at a weekend – went through a wide range of emotions. They lost 1-0 in the first match against Portugal, prompting BBC pundit Emlyn Hughes to be very critical in his post-match analysis and sparking a war of words with England manager Bobby Robson. The second match against Morocco brought more disappointment with a 0-0 draw and the loss within minutes of injured captain Bryan Robson and red carded vice-captain Ray Wilkins. “It’s problems upon problems for England,” said ITV commentator Martin Tyler, cutting off co-commentator David Pleat in full flow as he saw Wilkins receive his marching orders. The BBC’s Barry Davies typically ramped up the melodrama at that moment in his highlights commentary, describing it as “disaster upon disaster for England”. Whatever the scale of one’s concern, England were in trouble. Things certainly looked bleak, but England could still make the last 16 as long as they achieved a result against Poland in their final group game. It was the BBC’s turn to show it live and in the opening minutes Davies was castigating England’s defending as they almost fell behind. But soon that would be forgotten as Gary Lineker gave them the breakthrough, accompanied by millions of viewers hearing co-commentator Jimmy Hill chortling with delight. It was a pivotal moment as England’s campaign at last got into swing. Hill could be heard again celebrating as Lineker put England 2-0 up, with his hat-trick completed before half-time as they won 3-0. Davies had been on form, save for his corny line of “never mind the sunshine and the altitude, it’s raining goals” as Steve Hodge put the ball in the net – only for the goal to be disallowed. But England were finally up and running. 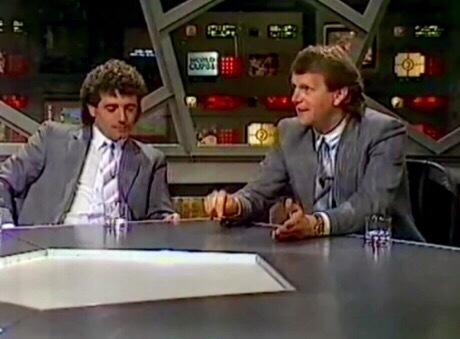 ITV employed a decent range of pundits for the tournament in their London studio, including former England colleagues Mick Channon and Kevin Keegan. Channon would leave his mark on the competition with his amusing inability to say Lineker correctly. “Linacre” was one effort; “Lyneacre” was another. It seemed almost as if he had been hypnotised into not being able to say the player’s name correctly! “We’ve got a month to get you to say Lineker properly for a start,” joked host Brian Moore during ITV’s preview show. It became a running joke during the coverage. Mick Channon (right), pictured with Kevin Keegan. Channon would also feature during another memorable moment in ITV’s tournament coverage. Brian Clough was again on the panel during this World Cup and as unpredictable as ever. During one discussion, Channon was offering his view that: “The Irish have done it. The French do it. The West Germans do it. We don’t.” The opportunity was too good for Clough to miss. “Even educated bees do it,” he quipped, to great laughter from Moore. Scotland had the misfortune to be placed in a group with 1982 runners-up West Germany, highly-rated Denmark and Uruguay, who were tipped by some beforehand as a potential winner. The Scots, under caretaker boss Alex Ferguson after Jock Stein sadly died suddenly the previous year, lost to both the Danes and Germans but the new format of the competition meant they still stood a chance of progression going into their match against the Uruguayans. A win would do it. Hopes that Scotland could get the win intensified when Uruguay were reduced to 10 men within the opening minute, setting the trend for a physical 90 minutes. Scotland had the numerical advantage but couldn’t make the breakthrough, leaving ITV pundit Ian St John a frustrated man as he watched in in the studio. Secretly he was being recorded and clips showing his anguish were played for the amusement of viewers a few days later to Elton John’s I Guess That’s Why They Call it the Blues. At least the footage reminded us that many pundits are in essence just like us while the match is on, feeling the same emotions and frustrations if things don’t go the way they want. The Scots once more went out after falling just short in their final group game, with Uruguay a new enemy for those north of the border. One particularly despondent fan told a TV interviewer: “I hate England. But if England get to play Uruguay I’ll support England, because that’s how much I hate Uruguay.” The Scot was no doubt cheered up in the next round when Uruguay lost to Argentina, saving him from having to cheer on the Sassenachs in the quarter-finals! Also sadly making an early exit with Scotland were Northern Ireland, unable to repeat their heroics of four years earlier but still putting up a decent fight in the Mexican heat. Their World Cup was probably best remembered for Pat Jennings (on his 41st birthday) conceding a stunning goal to Brazil’s Josimar. “Oh what a goal,” screamed BBC commentator John Motson, as the world briefly got all excited about Josimar before he faded into obscurity. When we return to this subject shortly, we will recall TV coverage of the knockout rounds including that unforgettable match between England and Argentina.